The Rebbe had reached the World of Truth, and had stood, like all other Jews, in judgment. It had taken a long time; after all, the Judge of the Universe is infinitely more exacting with the great tzaddikim than He is with anyone else. But eventually, He gave His pronouncement: the Rebbe would sit in Paradise with all the other tzaddikim. His heart pounded as he approached the shining golden gates, hung with draperies of purple and royal blue. Soon he would be re-united with his beloved wife, whom he had last seen in her shroud more than ten years earlier. Not one day had passed since then that he had not longed for her, the saintly woman in whose merit he had achieved so much. Soon he would see his own Rebbe, the tzaddik whose powerful yet gentle voice and deep brown eyes he remembered as though they had guided him through the paths of Torah but yesterday, even though his Rebbe had entered the World of Truth almost half a century earlier. He approached the table; he recognised them all, and all recognised him. He was, after all, one of Gedolei baTorah of his generation. The Alter Rebbe, the Hafetz Hayyim, Rashi, Rambam, Avraham Avinu himself, with his son and grandson Yitzhak and Ya’akov, were feasting at the same table, learning Torah. But something was missing. The Rebbe, throughout his long years in this world, had devoted his entire being to Am Yisra’el. Often had he said that he could never be truly happy as long as even one Jew was suffering in the world. And so the Rebbe returned to the Judge. He could not sit at the Feast, he said, until the Sovereign of the Universe would send the mashiach to redeem his people. The Heavenly Light dimmed as the Judge of the Universe considered. Finally He spoke. “Very well. You may plead the case of the Jewish People before Me. But this will be a fair trial: you will stand to My right to plead their case, but the Satan, the accuser, shall stand to My left to present the case against.” Almost before the Judge had finished speaking, the Satan was standing by His side, books in hand. All the Heavenly Hosts came to see this trial. It had been well over a hundred years since anyone had dared challenge the Sovereign of the Universe. The Rebbe almost quailed as he began to speak. Had not greater tzaddikim than he, greater by far, pleaded the same case – only to be defeated? In the audience he saw Rebbe Levi Yitzhak of Berditchev; he had pleaded his case in this very Court two centuries earlier. He had even come close to winning. And by him stood the first and greatest of the Hassidim, the Baal Shem Tov himself. (Even here in Heaven, he was still known as the Master of the Good Name.) He, too, had argued that the time had come to send the mashiach – and had been defeated. Had not the Gaon of Vilna, and the Sforno, and Rashi and Rambam and Rabbi Akiva pleaded the same arguments before, and had they not followed Avraham Avinu and Moshe Rabbeinu himself? Had not Adam been a mere few hours away from complete Redemption when he sinned? But the Rebbe stood firm. He may be a dwarf compared to them, but he was dwarf standing on the shoulders of giants. And whether he would win or lose his case, even if he would later be castigated for trying to bring mashiach ahead of his time, he knew that he was unimportant; only the Jewish people mattered. The audience looked to the Satan. His sarcasm was well known, and these arguments had been heard a thousand times before. He would have all his answers rehearsed. But no! The Satan was silent. But the Satan had spoken quietly, almost as though out of habit, without any real conviction. He was sitting calmly, a grim smile playing over his lips. The Rebbe continued. “If I may remind You of the words that Your beloved son Rebbe Levi Yitzhak of Berditchev said: ‘Even if some of Your children have more sins than mitzvot, their mitzvot are worth so much more than their sins’”. The Satan smirked, and seemed to mutter something under his breath, but otherwise made no reaction. The veterans of these Trials were dumbfounded. The Satan had never before been silent when he was threatened with the Redemption being granted to Israel, and he had never smiled before. Now he was doing both! Could it be that the time of Redemption really had – at last! – come, that the Rebbe would defeat the Satan? The Rebbe sat down, and the Judge turned to His left. “What have you to say?” He asked the Satan. That smile was still hovering over his lips, as grim as before and even broader. For some time, the Heavenly Light dimmed as the Judge considered. Eventually He called to His ministering angels. 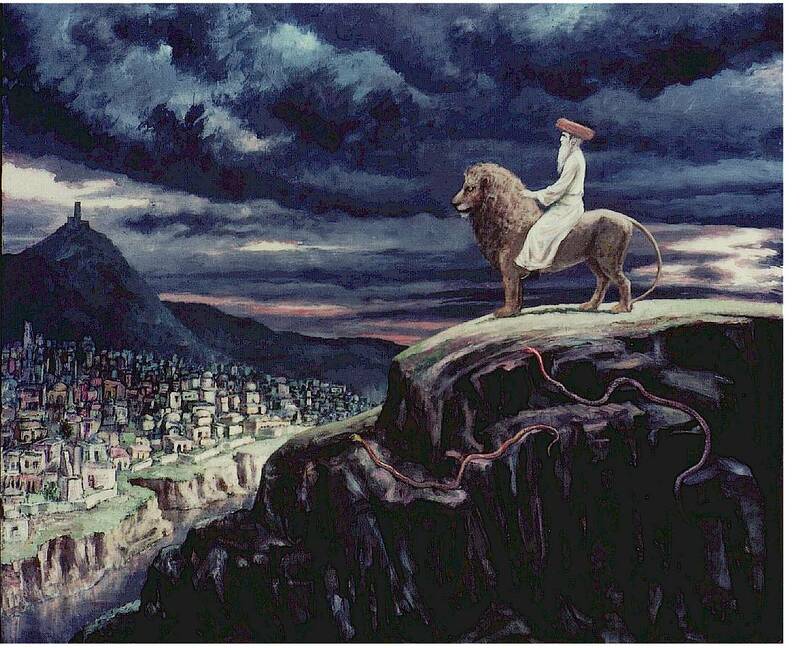 “Call Eliyahu the prophet to appear before Me,” He commanded. Eliyahu radiated light. Long centuries had he awaited this moment. He, too, remembered all the previous attempts at sending mashiach. He thought back on the hundreds of previous trials: he well remembered the strict logic of the Rambam’s legal arguments, and how the Satan had countered each one with his own legal responses. He had heard the cool simplicity of the Ramban, and how the Satan had tied him in knots. He had witnessed the threats of Rabbi Akiva of what he would do to the world if mashiach would not be sent, and the Satan’s counter-threats that made even Rabbi Akiva tremble. He remembered, more clearly yet, the fiery, passionate pleading of the Baal Shem Tov, and how the Satan had doused his fire with a few well-chosen sarcastic words. And after all this, now, at last, the time had come for him to herald mashiach’s imminent arrival. And as the Judge made His pronouncement, the few who thought of looking saw that the Satan, far from looking defeated, was smiling more grimly and more broadly than ever. In the small synagogue in one of the poorer neighbourhoods in Jerusalem, the rabbi was drawing to the end of his d’var Torah. They had long since finished reading the Megillah, and neither the rabbi, nor anyone else, even noticed the dignified old man enter quietly. Tonight was Purim, and a man dressed in robes and carrying a shofar did not attract attention the way it would any other time. “So Rabbi Shlomo from Karlin asked why Haman wanted to destroy all the Jews in a single day. Wouldn’t it be easier to spread it over several days? I mean, how many Jews can you kill in a single day with swords? They didn’t have machine guns or poison gas in those days.” And Rabbi Shlomo answered his question by saying that even this, the oppressor did out of hatred for the Jews: he said, perhaps I will fail in my scheme, and then they will make a holiday. Better that they celebrate only one day. And not ten minutes later, another hundred Jews had joined the crowd dancing round Eliyahu. Singing and dancing through the streets, more and more Jews came to see Eliyahu. From synagogue to synagogue, from pew to pew, from city to city ran the news. Eliyahu the prophet was here to herald the imminent coming of the mashiach! The Rebbe expected the Satan to look defeated, desperate. But that grim smile was still firmly in place. The prophet looked over the masses milling through Ben Yehudah Street. “So many pure, holy Jews,” he breathed, “so much kedushah”. He led his followers onward. One by one, all the youths quietened down. A group of boys, who had started a drunken brawl, suddenly fell into each others’ arms and embraced. The lewd pictures miraculously vanished. In the Court above, everyone was ecstatic. The Rebbe was laughing aloud as he looked down and saw the myriads of Jews dancing around Eliyahu, drawing closer to the Temple Mount by the second. Within minutes, the two thousand year desolation of Jerusalem would be ended. The ministering angels were aglow with golden light; even the sapphire Throne of Glory was a deeper, more majestic blue than ever before. By now, no one could stop the Redemption on this night of Purim. Even that grim smile on the Satan’s lips no longer held any terrors for the Rebbe. He had defeated the Satan, and had brought the Redemption to Israel. Perhaps – the thought occurred to the Rebbe for the first time – perhaps the Satan really wanted to be defeated. For after all, the Satan, too, was one of God’s angels. The Rebbe felt that, at last, he understood the smile on the Satan’s face. “Then come with me.” Eliyahu was surprised: this was a command. He followed. “So last time you were here, you were taken away in a fiery chariot. Nowadays we have a different kind of chariot,” said one of the men in blue. His companions laughed roughly. Before Eliyahu knew what was happening, he felt himself thrown violently into a van. As the light began flashing and the siren started wailing, he peered out through the bars on the windows. Within less than five minutes, he was in the Russian Compound. Again, the prophet was roughly seized, jerked out of the van, and thrown into a cold room with a hard, cold stone floor. He was now thoroughly unhappy. What had gone wrong? What had he done wrong? Not since the days of Ahab and Jezebel and the prophets of the Baal had he been treated like this. “Are you Eliyahu the prophet?” But his tone was even harsher than the previous one. Eliyahu appealed the decision. But in court, he saw no honest Judge, no tzaddik to defend him. Only accusers. “More than enough,” added the judge on the left. There was a brief, shocked silence in the court. “Is this what you did? You would kill so many children in cold blood? Have you never heard of the Commandment, ‘Thou shalt not murder’? But then, his disciple Elisha was in Beit El. What can you expect from a settler?” He spat the final word in contempt and disgust. He was sentenced to a year in prison for leading an illegal demonstration, three years for resisting arrest and assaulting a police officer, eight years for incitement to murder, ten years for incitement to revolution, fifteen years for attempting to destroy the mosques on the Temple Mount, and forty-two life sentences for partner to murder of forty-two boys. That night in his cold cell, Eliyahu the prophet cried. Lonely and bewildered, he prayed to God to return him to the World of Truth. His mission had failed. In the Court, all were quiet. The Trial had been held, the decision taken, permission granted, the Satan defeated, the attempt carried out, but there would be no rejoicing. The Satan sat alone in a corner, needing to speak to no one and no one wanting to speak to him. His smile was terrifying in its grimness and broadness. His relaxed attitude said it all: Why bother to work, to argue, even to get excited, when so many people down there have the power to do my work for me without my even asking? And the Rebbe had tears in his eyes. He truly understood, at last, the smile on the Satan’s face. Daniel Pinner lives in Kfar Tapuach with his newlywed wife, Tzipporah. The views of the author do not necessarily reflect the opinion of Your Jerusalem. The mission of Your Jerusalem is to provide an independent forum for authors from the entire spectrum of Israeli and Jewish society, in order that the reader may get a better understanding of the trends, events and news-makers in the Israeli and Jewish world. Log in | Register |	91 queries. 0.609 seconds.